Do you have old furniture that is worn? Are you worried about the cost associated with buying new furniture and are wondering can your old furniture be salvaged? Then get in contact with A1 Naas Contract Cleaning today. Our upholstery service involves the salvaging of old furniture revitalising it with a deep steam clean that brings it back to its former glory. Our expert team of upholstery cleaning experts work to remove even deeply ingrained stains, and help remove odours. This service is particularly attractive to those with antique furniture that has become musty or encrusted with dust. Has your home furniture become worn down? Then get in contact with A1 Naas Contract Cleaning today. We’re the upholstery cleaning experts. Our upholstery cleaning service is completely customer focused. We work alongside the customer in finding how they want their furniture cleaned. We use gentle steam cleaning techniques which remove stains that have become embedded into the fabric of the furniture. 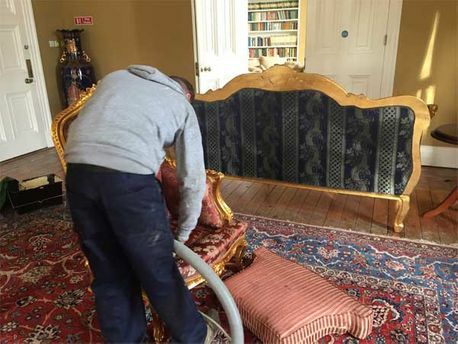 No matter what type of furniture you have, our team are able to thoroughly clean the upholstery. Our upholstery cleaning service is tough on the stains whilst being gentle enough not to dye or damage the furniture’s fabric. Do you need furniture at your residential or commercial property cleaned? Then get in contact with A1 Naas Contract Cleaning today.